As summer comes closer to an end, I crave doing the summer time activities before we can't do them anymore.....going to the beach, attending the fair, summer picnics, spending time in the garden, etc. What summer activities do you love to do and which ones will you miss the most?? With that in mind, I created this summer themed card with Laura's Sketch 58 at 2 Sketches 4 You. I rotated the sketch to make it work with my theme. I loved using the Coredinations cardstock for this card. The different shade in the core of the cardstock stand out when sanded and really make the card...especially on the sand and waves. I also created it for the Lil Red Wagon Summer Theme Challenge. too too cute Amy! 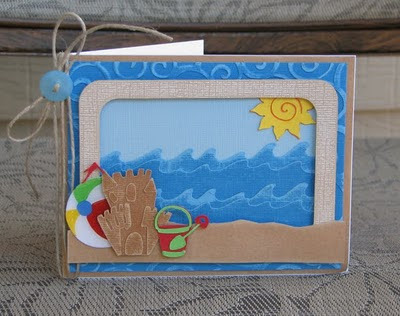 Love Summer and your themed beach card makes me remember, I need to get to the beach! This is just as cute as can be! LOVE the beach scene!! This is just adorable! Perfect for summer. So glad you could play with us this week at 2S4Y! wow, this is super cute....have a fantastic week! That fits its name. It is really a summer card. It so amazing how think of that design. You made wish that it is summer already. I miss the beautiful beaches in that card. Hi Amy! I found you through the cricut mb blog hop. I love your work..this card is so cute! This is such a cute card. I love the hemp on the side. Thanks so much for stopping by my blog and leaving such a nice comment! Good luck in the giveaway! oooo super cute. Sooo much detail! I love it! Love this, I went to the beach this summer so I will have to remember this one. Your card is just the cutest thing, so fitting to a summer theme and wowie on how you rocked the Core'dinations!! I love your card - that embossing is wonderful and I love that little sun peeking out from behind the frame! So cute, and such happy colors! Wow what a cute card ! Love all colors and creativity ! This is just amazing. I love all the details. Beautiful. Great card! I love the blue and brown tones with splashes of brighter colours.